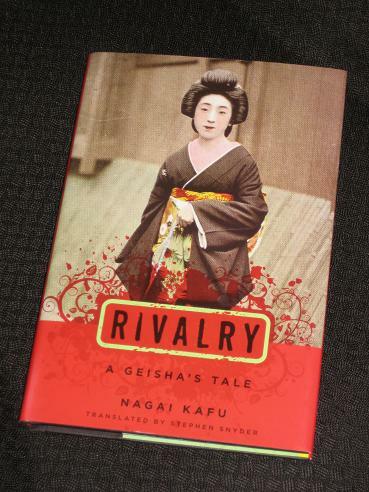 Nagai Kafu’s Rivalry – A Geisha’s Tale (translated by Stephen Snyder, published by Columbia University Press) is an excellent trip through the world of the fascinating Japanese courtesans. It begins with a chance encounter at a theatre, as Yoshioka, a successful businessman, notices a face from the past. His conversation with the beautiful Komayo is our ticket into the hidden world of the geisha. Komayo, formerly known as Komazo, had retired from her career as a geisha after marrying one of her clients and moving to the provinces. However, after her husband’s death, a combination of homesickness and her new family’s attitude brings her back to Tokyo. She returns to Shimbashi and the career she thought she had put behind her – and for the new girl in town, picking up again with the brash Yoshioka might just be the break she needs. What makes the setting of Rivalry so intriguing is the gradual uncovering of a whole interdependent society. The centres of this world are the theatres, where actors, the leading lights of the quarter, entertain the hordes of businessmen and their female companions. Later, the audience might head off to a tea house, where they will listen to music played by their favourite geisha, or perhaps indulge in a little harmless flirting. Behind the scenes though, there are thousands of other people dependent on this night-life: maids, rickshaw drivers, bath house attendants, kimono makers… The more we read of Rivalry, the further we are allowed to see into this world. What exactly is it he’s telling us though? Is Rivalry glorifying the geisha, à la Memoirs of a Geisha? Is he showing the reader how the profession empowers women? Is he lamenting a system of sexual quasi-slavery? Erm, the answer to all those questions is probably no. The book concentrates on description, not proscription, and it is up to the reader to make up their own mind about how palatable it all is. Stu – Definitely a good one if you want to know about that side of things. It's an area Nagai has virtually made his own. Wonderful review. I'm torn between reading this and Mineko Iwasaki's book Geisha. Have you read that one? How do they compare do you think? mee – That's not one I've heard of, but thanks for the tip 🙂 This is well worth reading for anyone intrigued by the life of geishas, and the Nagai short stories I've read in various collections are good too. ← Another Edition of Nichi-Yōbi News!